Misaligned pulleys is a common problem in belt driven machines. Pulleys that are not properly aligned cause uneven tensioning wear of the belts. This causes belts to slip and wearing-out as well the belts as the pulleys. Extra belt tension, good or not good? Especially machinery that doesn't run continuously and regularly starts and stops will cause increased wear on the driving belts and pulleys. Only too often the problem of slipping belts is solved with adding some extra tension. This however causes unnecessary high loads on the bearings which will decrease the bearing life time. Besides the fact that misaligned belt drives cause increased vibration and wear are these misalignments also causing an increase in noise production which is awkward for personnel and environment. 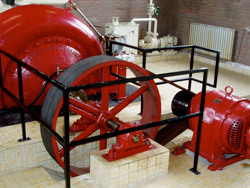 Traditional pulley alignment methods have the disadvantage that the side of the pulley is used as a reference. However a correct alignment means that the V-groves of the pulley are aligned. Also most belts have a maximum angle offset specified of 0,5°. Something that is very difficult to check with a straight edge and the naked eye. 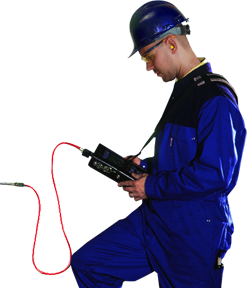 Van Geffen VMS therefore always uses laser equipment for the alignment of belt driven installations. This has besides the accuracy the advantage that also large distances can be measured with very compact equipment.